Elvis Presley’s favorite roller coaster the Zippin’ Pippin is coming down. Yesterday, a demolition crew began to tear down the classic 1923 out and back woodie.Efforts to save and relocate the roller coaster from the closed Libertyland amusement park failed. 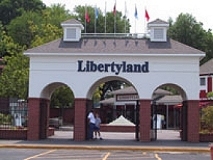 The city is spending $2 million to demolish the remains of Libertyland and the fairground property, so they can proceed with plans to redevelop the Mid-South Fairgrounds property. In November the city hired an expert to see if the roller coaster was salvageable. 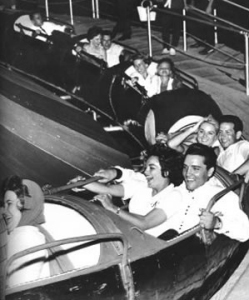 After a section of the ride was tore out, it was estimated that it would cost millions to restore or rebuild it. Zippin’ Pippin has been sitting unused, exposed to the elements, since Libertyland shut its doors forever in October 2005. During the evenings events at Libertyland 2002 Joe Esposito related the story of how Elvis would fools around at Libertyland. His favorite joke was to ride the Zippin Pippin to the top and get the attendant to stop the cart at the top where he would get off and hide. When the cart returned and Elvis was not there everyone (not in on the joke would freak out) thinking Elvis had fallen out along the way. Finally, Elvis would arrive in his usual casual manner, laughing hard and long. Before the outdoor fun began, we had the pleasure of hearing stories by several Elvis friends, including Joe Esposito, Larry Geller, Jerry Schilling and Julie Parrish (Paradise Hawaiian Style). It was also great hearing Julie Parrish telling how she didnt get the part in Paradise Hawaiian Style until she agreed to a tiny part in another movie. She didnt care – she just wanted to work with Elvis! Who wouldnt Julie? Julie Parrish who co-starred with Elvis’ 21st movie PARADISE HAWAIIAN STYLE told how she contrived to be in an Elvis movie. A huge Elvis fan, her lifelong ambition was to secure a role in an Elvis movie. Finally, after years of nagging her agent to offer her services, Hal B Wallis the director agreed to give her a screen test – in his office. Although Julie Parrish considered (only for a split moment) that she may have to deliver, her agent rang through to Wallis office with an urgent call from Julies mother. That stopped Wallis in his tracks. 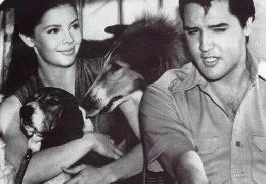 Thinking that not obliging Wallis would ruin any chance for her to co-star with Elvis, she went home despondent However, fate was on her side, and several days later, Julie Parrishs wish came true!